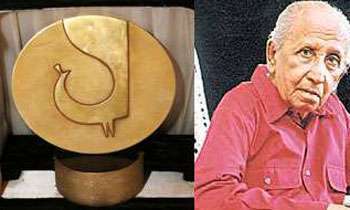 Police today handed over veteran filmmaker, late Dr. Lester James Peries’ lifetime award, which was found in a private bus recently, to his wife Sumitra Peries at her residence. The award, which was stolen from Lester’s residence while his funeral service was in progress on May 2, was later found in the overhead rack of a private bus operating on the 177 route. WELCOME BACK PEACOCK AFTER TRAVELING IN A PRIVATE BUS. The one who stole that finally knew that he cannot sell it after so much publicity given to the theft. Remember someone saying that this award was never in the possession of Lester. Wonder what he has to say now! Ideally the reporter who published that article should have the guts to go and ask ?? Yes DM must talk to him again. Fine police job.why not doing same about billions dollers roberies too???. Those treasure hunters might killed the lady. Government have to give secure the woman .